Farmers, Historians, and Assasins Oh My! 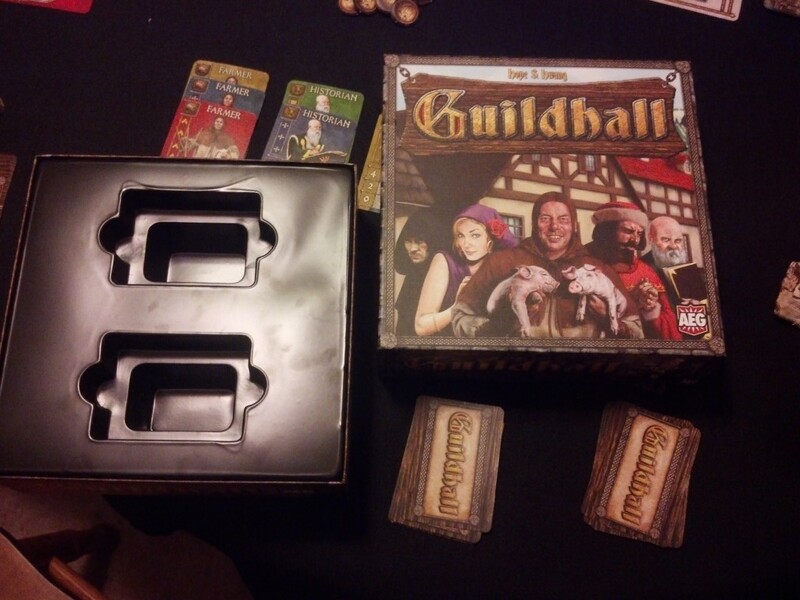 Guildhall, also known as Guildhall: Old World Economy is a wonderful little gem of a game from AEG that I recently had the pleasure of checking out and playing profusely so that I might bring you a solid review. Guildhall is definitely a euro style card game but it’s not a cube pusher about planting crops or, contrary to its cover, the highs and lows of being a creepy pig farmer. Not that there’s anything wrong with farming, or pigs, or cubes, for the record. However Guildhall does a good job of being a euro that also gives you a sense of espionage and skullduggery as you try and manipulate your way into the prefect scenario for acquiring gold coins, AKA victory points! Not a lot of euros allow for player interaction of any kind, let alone the kind that lets you directly screw over your opponent. Now, Guildhall might not look like much at first, but after your first play though you’ll start to realize that the simple ‘set collecting’ mechanic of the game goes much, much deeper than you might think. There are so many angles to play when trying to overcome your opponents, so many in fact that it will take you a few games to pick up on all of them. You need a set amount of victory points to win the game, and when there are so many ways to get them, coupled with ways to stop your opponents from getting them it all adds up into this very slick, savvy experience. The game plays in about 30 minutes but your first play though will probably take around 45 minutes due to the lack of succinct explanations for each card, though hopefully this review can help shorten that. I’m going to let the video review I did speak for itself instead of repeating myself in text form here. So watch the video and then hit my pros and cons list below and tell me what you think! 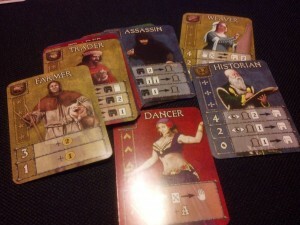 Production Values: Great quality card stock which seems to be a standard with AEG’s products. The box is just completely unnecessary in every way, but is solid and durable. The cards are colorful and very iconic, nice that there are symbols for colorblind folks. Fun fact: I accidentally spilled this beer (which drinks like motor oil) all over the box and the cards, but looking at the game right now you’d never know. Quick to learn, harder to master. Gameplay is extremely satisfying. It plays fast, but you can stretch it out if you want it to. Making this one great for filler, or focal point during game night. For a euro, you can interact a lot with your opponents which is something I love! The Rules could use another page, just one more to explain each card briefly! Gratuitous misuse of packaging, zero extra room and the cards barely fit as is. Also, no room for the upcoming expansion pack!